This workbench article is how I painted my original Ork Wartrakk. You can see how I painted another one here. This model was originally designed for Gorkamorka, and then became part of Warhammer 40K with Codex Orks. The model was built with the crew left off for painting separately. The Big Shoota stayed with the gunner. The Wartrakk model was given an undercoat of black and then the bits that were missed were touched-up with Chaos Black, it was then given a drybrush of tin bitz and chainmail. Then particular details were picked out, baggages was done in brown, forks were painted chainmail and the fuel tank was done in red with a chestnut wash. The crew (now stuck onto temporary bases) were also given a black undercoat and then do all the metallic bitz with a drybrush of tin bitz and chainmail. Uniforms (and I say that in the broadest possible sense with orks) are usually Codex Grey with highlights in a lighter grey. Some aspects of the uniform was done in red, with a tinned wash of chestnut ink. There is still some more detailing to do including adding glyphs and icons to the body of the Wartrakk. 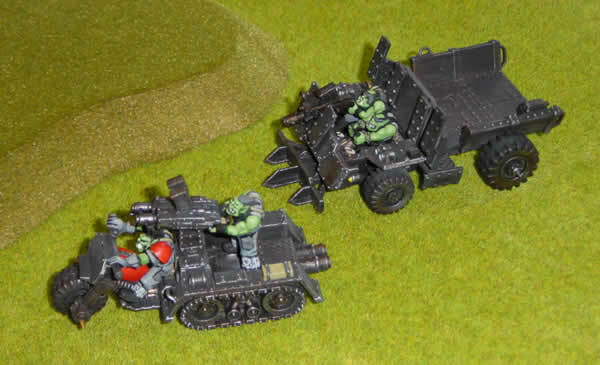 For my next Wartrakk I intend to follow the same process I used for the Grot Bomb Launcha.